Here’s what’s up in the world of TV for Tuesday, May 31. All times are Eastern. 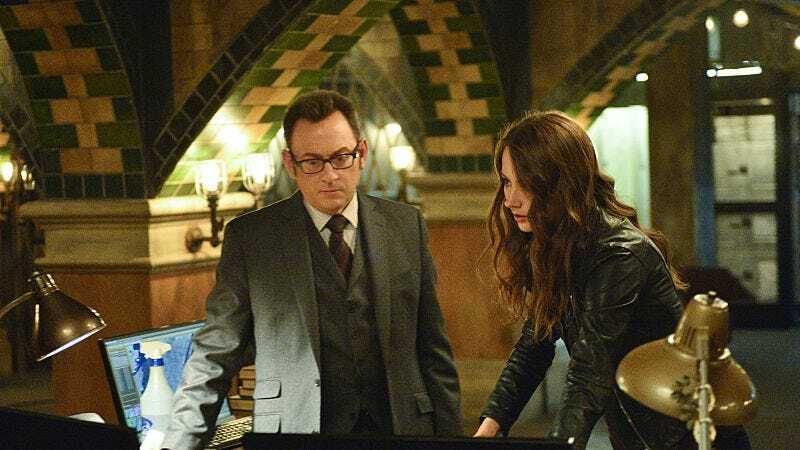 Person Of Interest (CBS, 10 p.m.): The show hits the century mark in style as Finch’s own number comes up after his cover is blown, and all hell breaks loose as Samaritan’s operatives get involved. Now, maybe we’re putting too much stock in Michael Emerson’s other iconic role, but we’re just assuming this is all part of his true, impossibly complex masterplan. Alexa Planje would point out to us that we still don’t actually know Finch’s real name, but she’s afraid of giving an idiot like us any ammunition for our harebrained Lost-related theories. The Mindy Project (Hulu, 3:01 a.m.): We said The Mindy Project would start being a top pick by default once the spring TV season ended, but, man, the show is really not meeting us halfway here by not giving us an episode description to work with. All we know is the episode is titled “Under The Texan Sun,” so we’ll just go ahead and assume this is the animated crossover with King Of The Hill that we’ve all—yes, all, damn it—been waiting for. Gwen Ihnat doesn’t hate that idea. Extinct Or Alive: The Tasmanian Tiger (Animal Planet, 9:00 p.m.): Bit of a weird choice, we realize, but we’re intrigued by the premise, in which wildlife experts head to Tasmania “to investigate possible sightings of the Tasmanian tiger, which was declared extinct in the 1980s.” Now, we realize that if they did actually find living Tasmanian tigers, we probably wouldn’t first find out about it on this show, but still! We just want to believe in something for once! Peaky Blinders (Netflix): The third season of this BBC Two import drops on Netflix today. You know, even as the English part of the What’s On Tonight gestalt entity, we’ve got to say: The title “Peaky Blinders” is just weapons-grade English, to the point we still can’t believe it’s the name of a real historical gang that inspired this gritty crime drama and not just ridiculous self-parody. We probably should have known better when we saw Cillian Murphy was the star. He’s much too unnerving to do jokes. Powers (PSN): The PlayStation Network is releasing the first three episodes of this show’s second season, an adaptation of the much-loved comic series by Brian Michael Bendis and Michael Avon Oeming. Since the first season wasn’t all that good, the show is doing what any self-respecting show like this does in its second season to goose viewership, which is cast a metric crap-ton of recognizable genre favorites in guest roles. So then, coming this season: Michael Madsen! Tricia Helfer! Enrico Colantoni! Wil Wheaton! Much like with last week’s Stitchers entry, this feels like the genre TV equivalent of Deadspin’s acclaimed “Let’s Remember Some Guys” series. America’s Got Talent (NBC, 8 p.m.): In case you assumed the demise of American Idol and The X-Factor meant we were finally, finally done with Simon Cowell, think again! The 11th season of America’s Got Talent kicks off with him taking over a judge’s chair, one whose lineage includes Howard Stern and Piers Morgan. Goodness, what asses that chair has seen. Maya & Marty (NBC, 10 p.m.): We guess it’s time again for a network—feels like it’s usually NBC, probably because of the Saturday Night Live pipeline—to have a bash at a variety show, a format that was last even moderately successful with, what, Barbara Mandrell And The Mandrell Sisters? (We won’t even pretend we knew about that show before we looked it up just now. It went off the air in 1982.) But hey, a show doesn’t need to be a multi-season fixture of the airwaves to be charming and worthwhile on its own terms, and here we’ve got hosts Maya Rudolph and Martin Short, joined by first-episode guests Jimmy Fallon, Miley Cyrus, Larry David, and Tom Hanks. Yeah, so, we’d say there’s some good and some not so good there, all things considered. Teenage Newlyweds (FYI, 10 p.m.): “In the series premiere, three young couples”—wait, wait, just a second, let’s read that again. “In the series premiere”!? How is this even possibly a new show? We feel like we’ve written snarky, ignorant blurbs for this show at least 50 times already. USA and WWE have announced that come July we’ll be getting two live wrestling shows each week, with Raw still on Mondays and a now live Smackdown moving to Tuesdays. To prepare, we humbly present a video titled “Best Smackdown Ending Ever,” alternately called Finishing Moves: The Opera. “Once Upon A Beginning,” Garth Marenghi’s Darkplace (Seeso): No particular reason for picking this beyond it being the greatest show ever made in the history of television. Ask anybody.